Once Upon a Time Machine finally debuted in stores last week, with a killer release party at Locust Moon Comics in West Philadelphia. You can still visit the store and see original art from the book adorning their art gallery! 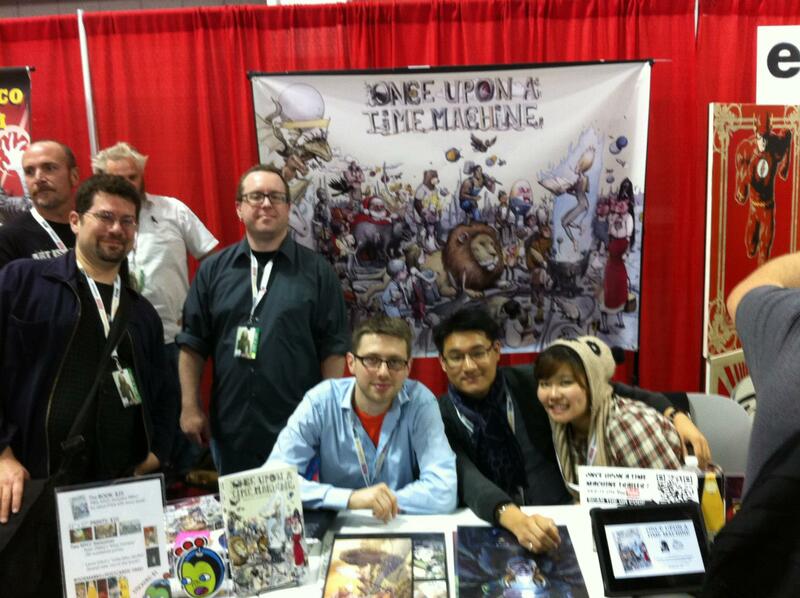 The day after the book’s release party, we made our convention debut at NEW YORK COMIC CON. Over 20 Time Machine creators were in town for the convention. It was the first time many of us had met in person, some of us having known each other for years and years online. The picture above shows just a few of us at our table in Artist Alley, where we spent the weekend selling books and prints, signing everything, and giving away way too much cool free stuff. We brought a ton of books to the convention, and we sold…all of them. When people heard what our little (big) book was about and had a chance to flip through it and take in the breadth of vision that comes from packing 90+ creators between two covers, they got really excited. In fact, we spent more than half of Sunday (in addition to the last few hours of Saturday, before we restocked) having to turn excited folks away — we had nothing to sell them! Our trailer playing on the Dark Horse booth’s monitors. 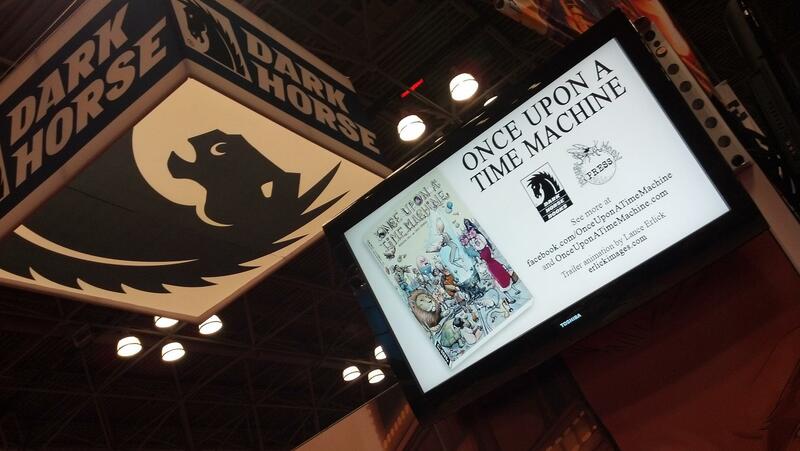 Even Dark Horse themselves sold out of Once Upon a Time Machine! Hopefully everyone interested remembered and was able to grab a cheap copy off Amazon or something when they got home. Sorry we couldn’t sign those copies, too! 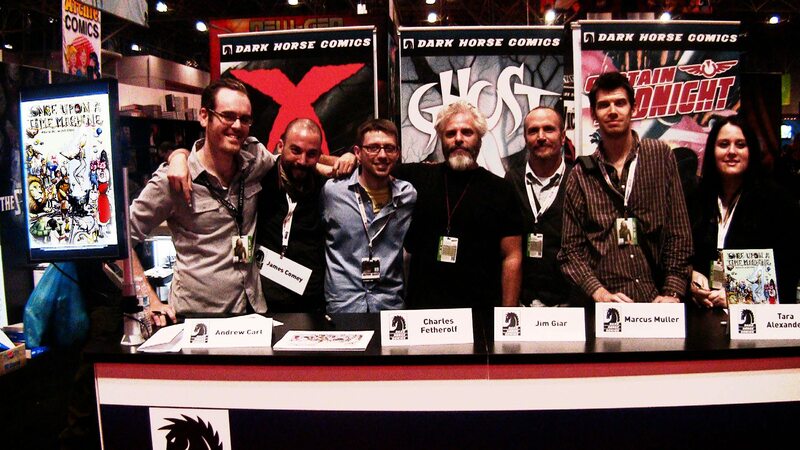 But let’s get back to Friday night for a second — and our signing at the Dark Horse booth! We met a lot of great people at the signing — many of whom, honestly, were just hearing about the book for the first time. But after chatting with us and seeing what Time Machine had to offer, lots of those folks bought a copy right there on the spot! We’ve got to thank Dark Horse’s amazing Kari Yadro, who ran the signing, helped get the word out, and just generally made the DH booth a great place to be for us first-timers and our (figuratively) little book that could. Getting to know our fellow creators better, talking about the book to hundreds of excited & new fans, signing lots and lots (and lots) of books, and working with the great people at Dark Horse…honestly, the NYCC experience could not have been more fulfilling.